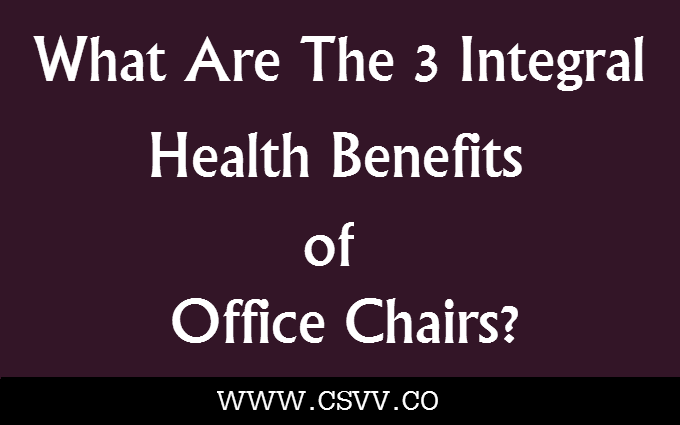 What Are The 3 Integral Health Benefits of Traditional Office Chairs? Office goers usually tend to spend many hours in the office, but seldom do they question if they are sitting on the wrong type of office chair, which can be extremely harmful for their health. This is where ergonomic traditional office chairs can come for your rescue. Designed as per your body, these chairs are considered to be the best option for those who work for long hours in the office sitting on the chair. There are many health benefits offered by these chairs, and these benefits should never be neglected when you decide to purchase these chairs for your office. This is what brings us to the 3 integral health benefits of traditional style office chairs and why they are so important for your employees. Apart from being stylish, affordable and easy to maintain there are many more advantages offered by these types of chairs, and a majority of them are associated with the health aspect. In fact, only a comfortable chair can encourage your employees to work in an efficient manner whereas an uncomfortable one would do just the opposite. The importance of having a perfect posture is known to all, but what does your workplace chairs have to do with it? Well, the use of office chairs can influence the type of posture balance that you hold. After sitting in your usual office chair if you start feeling back pain, neck pain or uneasiness after a few hours or a few days of use then this is a clear indication that your posture was not right and as a result of which you have become a victim to these complications. If you are sure that your posture is right but still are suffering from the same problem, this is where the chair turns out to be culprit. The traditional office chairs are flexible and thus facilitate in better posture. No matter how many hours you spend working on these chairs, your work will be done without any sort of uneasiness, or troubles that are often related with other types of chairs. There are many people who think that sitting is a relaxing activity. Though after hours of hard work, and labor when you get to sit just the way you want as per the need of your body, that can be relaxing but when you are working for hours, then that at times can turn into a painful experience. This is because when you sit at one place for a prolonged period of time then stress is experienced on those body parts that manage the entire body weight. As time passes by, the blood flow reduces and soon pain is exerted. However, when you are sitting on a traditional office chair then you will suffer from little or no body ache, as these chairs are designed to promote blood flow across your body. This accelerates better functioning and thus reduces stress on your body parts. Nothing can match up to the quality, strength and durability of high quality traditional office chairs. They are amongst those few ergonomic chairs that can make sitting a relaxing experience even when you sit for hours at a stretch. Hence, if you want to perform the best at your office or want your employees to provide their best results to you then consider replacing the same old office chairs with the traditional ones, as they can bring a lot of difference to the productivity of workers. Traditional furniture adds a very unique look to the office and integrates style and comfort effortlessly under one roof. If you want to furnish your office with an elegant look then you can use these traditional office chairs and for that, you can search through several available portals, and choose your favorite design accordingly. How Clean Is Your Office, Really?